Join our winning fight against Big Money! One of the most powerful things we can do even before Citizens United is overturned is to pass voluntary public financing of campaigns to get politicians out of the fundraising game and allow new candidates with good ideas the chance to run and win. The city of Berkeley just made a resounding statement calling for Fair Elections by overwhelmingly passing the strongest voluntary public financing matching funds system anywhere in the country with 65% of the vote. With Measure X1, candidates must show broad support and voluntarily choose to refuse any money from special-interest PACs or any contributions greater than $50 to qualify for public financing. In exchange, they receive $6 in matching funds for every $1 they raise from everyday Berkeley residents. 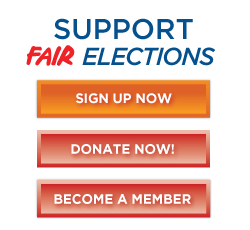 Measure X1 serves as a great model for other California cities and the state of a matching funds system will empower small donors and keep Big Money out of elections! Measure X1 was another example of how grassroots activists and coalition partners can make all the difference in the fight against Big Money. Though the first poll showed a lot of undecided voters who didn't know about Measure X1, a strong local campaign led by Berkeley leaders like Dan Newman and Sam Ferguson and our friends at California Common Cause, with assists from numerous state and national reform groups led to its overwhelming victory. Thanks to Clean Money volunteers like David Schmidt, Gary Appell, Carla Kincaid-Yoshikawa, and Charley Marsteller for joining all the UC Berkeley students and other volunteers who knocked on doors telling people about Measure X1, and to everybody else who told your Berkeley friends to vote Yes! Berkeley isn't the only place that passed public financing of campaigns this November: South Dakota passed a comprehensive anti-corruption initiative that includes public financing in the form of $100 worth of "democracy vouchers" that any voter use to give to the qualified candidate of their choice. So from deep blue Berkeley to deep red South Dakota, voters agree we need public financing of campaigns to empower voters and keep Big Money out of politics! Join as a Clean Money member to help us keep scoring victories against Big Money! Become a Clean Money Member Now! I can't become a member now, but I will chip in with a one-time donation of $5 or more.